mAb HC-10 loses its reactivity with HLA class I (HLA-I) H chain (HC) following its association with β2-microglobulin (β2m). Furthermore, the HC-10 defined epitope appears to be involved in the pathogenesis of spondyloarthropathies, because HC-10 reduced their incidence in HLA-B27+β2m°/MHC class II knockout mice. This study has characterized the determinant recognized by HC-10. Panning of a phage display peptide library with HC-10 resulted in isolation of the motif PxxWDR, which could be aligned with P57, W60, D61, and R62 of the first domain of the HLA-I HC allospecificities reactive with HC-10. 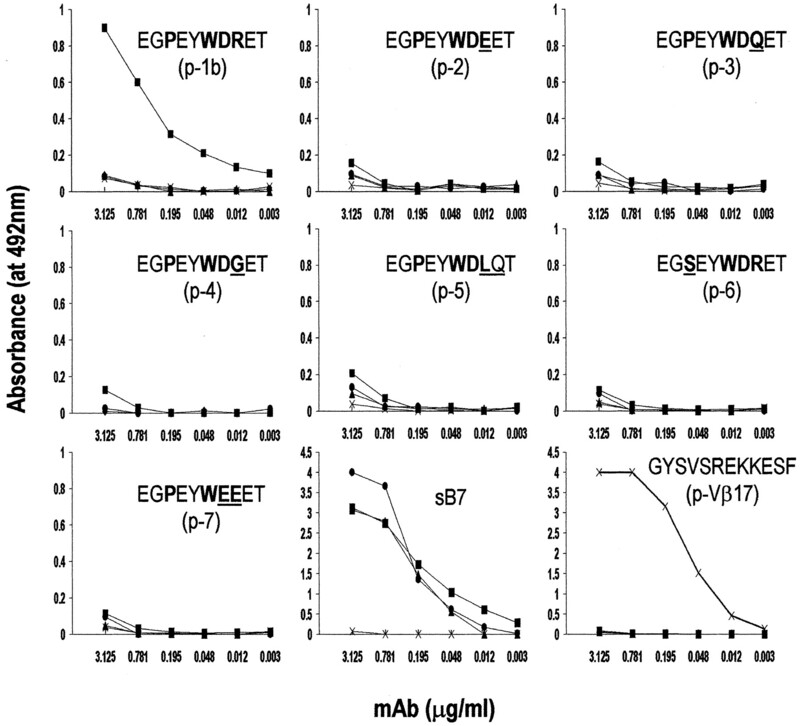 The 55EGPEYWDR(N/E)T64 (p-1) is the shortest motif-bearing peptide that reacts with HC-10 and inhibits its binding to soluble HLA-B7 HC, irrespective of whether N (p-1a) or E (p-1b) is present at position 63. By contrast, HC-10 did not react with six additional peptides, each bearing motif amino acid substitutions present in HC-10-not-reactive HLA-I allospecificities. The p-1-derived Qp-1, synthesized with the additional conserved Q54, which displays the highest in vitro reactivity with HC-10, was the only one to induce in mice IgG resembling HC-10 in their fine specificity. Mapping of the HC-10-defined determinant suggests that the lack of mAb reactivity with β2m-associated HLA-I HC is caused by blocking by the peptide in the groove of β2m-associated HLA-I HC, though a role of HC conformational changes following its association with β2m cannot be excluded. This information contributes to our understanding of the molecular basis of the antigenic profiles of β2m-free and β2m-associated HLA-I HC and may serve to develop active specific immunotherapy of spondyloarthropathies. Like their counterparts in other animal species, mature HLA-A, B, and C Ags consist of a 9–11 amino acid-long peptide and a polymorphic 45-kDa glycoprotein (H chain (HC)3) noncovalently associated with the monomorphic 12-kDa polypeptide β2-microglobulin (β2m). It has long been known that association with β2m is required for transport and cell surface expression of the HLA class I (HLA-I) three molecular complex (1) and that the antigenic profile of β2m-associated HLA-I HC is markedly different from that of β2m-free HLA-I HC (2, 3). Therefore, with few exceptions (4), Abs reacting with β2m-free HLA-I HC do not react with the HLA-I three molecular complex (5, 6). mAb HC-10 is one of the few mouse mAb which react with β2m-free HLA-I HC (5, 7), but not with β2m-associated HLA-I HC. Whether this lack of reactivity reflects changes in the antigenic profile caused by the structural changes induced by association with β2m and/or steric hindrance because of close proximity of the antigenic determinant with the areas of the HC occupied by the peptide located in the HLA-I groove is not known. Like the mAb LA45 (8), L31 (9), and HCA2 (10), which also react with β2m-free HLA-I HC only, mAb HC-10 reacts with many, but not with all HLA-I HC (7, 11, 12). In addition, the epitope it recognizes appears to be involved in the pathogenesis of human-like spondyloarthropathies, because administration of mAb HC-10 reduces the incidence of the disease in B27+β2m°/MHC class II knockout (Aβ°) mice (13). The determinant recognized by mAb HC-10 has been identified and characterized in the present study. This information contributes to our understanding of the molecular basis of the differences in the reactivity of mAb HC-10 with β2m-free and β2m-associated HC, as well as with classical and nonclassical HLA-I alleles and contributes to defining an immunogen to develop active specific immunotherapy of spondyloarthropathies. Female BALB/c mice (8- to 12-wk-old) were purchased from Charles River Breeding Laboratories (Milan, Italy). The human T lymphoid cell line CEM (HLA-A1/31, -B8/40, -Cw7/9) was purchased from the American Type Culture Collection (Manassas, VA). Cultured human B lymphoid cells C1R-sB7 secreting large amounts of soluble β2m-associated and β2m-free HLA-B7 HC (14) were a kind gift from Dr. C. Grumet (Stanford University, Stanford, CA). Cells were grown in RPMI 1640 medium supplemented with 10% FCS (HyClone Laboratories, South Logan, UT) (complete medium) and 5 mM l-glutamine. Electrophoresis reagents were purchased from Bio-Rad (Hercules, CA). Unless otherwise specified, all chemicals were purchased from BDH Chemicals (Poole, U.K.). The mAb HC-10 (IgG2a) which recognizes a determinant preferentially expressed on all β2m-free HLA-B and -C HC and on β2m-free HLA-A3, A10, A28, A29, A30, A31, A32, and A33 HC (Ref. 7 ; H. Grosse-Wilde, unpublished observation); the mAb W6/32 (IgG2a) which recognizes a monomorphic conformational determinant expressed on all β2m-associated HLA-A, B, C, E, and G HC (15, 16); the mAb TP25.99 (IgG1) which recognizes distinct determinants expressed on all β2m-associated HLA-A, B, C, and E HC and on all β2m-free HLA-A, B, C HC except A2, A10, A29, A31, 32, 33, A68.1, A69, and B73 (4, 17); and the mAb L31 (9, 12) which recognizes a determinant preferentially expressed on β2m-free HLA-B HC were produced and characterized as previously described. The BALB/c mouse mAb 655 (IgG1) and its corresponding Ag, the human Vβ-17 TCR-derived peptide GYSVSREKKES (p-Vβ17), were used as controls. HRP-conjugated avidin and xenoantibodies to mouse IgG (Fc portion) were purchased from Jackson ImmunoResearch Laboratories (Avondale, PA). HRP-conjugated anti-M13 Abs were purchased from Pharmacia-LKB Biotech (Uppsala, Sweden). mAb were purified from ascites by sequential precipitation with caprylic acid and ammonium sulfate (18) or by affinity chromatography on protein G (or protein A)-Sepharose (Pharmacia-LKB). Purity was assessed by SDS-PAGE as previously described (19). mAb concentration was determined in a bicinchoninic acid assay (Pierce, Rockford, IL). Purified mAb was coupled to biotin using the biotin-N-hydroxysuccinimide ester (Sigma-Aldrich, St. Louis, MO) (20) or to FITC (Sigma-Aldrich) (21) as previously described. Soluble HLA-B7 HC were purified from spent medium of cultured C1R-sB7 cells as described elsewhere (22). Peptides were synthesized at the Sigma “peptide synthesis service” (Sigma-Genosys, Cambridge, U.K.). Their quality was determined by analytical reverse phase chromatography and mass spectral analysis. Their purity was >80%. The Ph-12 Phage Display Peptide Library kit was purchased from New England Biolabs (Beverly, MA). This is a M13-filamentous phage display peptide library containing a repertoire of 1.2 × 109 sequences of random 12 amino acid linear peptides fused at the N-terminal sequence of the M13 synthetic minor coat protein pIII (five for each virion), via the flexible linker GGGS, with an overall sequence PFYSHSX12GGGSA. The panning of the peptide library with mAb HC-10 was performed according to the manufacturer’s instructions with the following modifications. Phage particles (2 × 1011) were incubated with 30 μl of packed protein G- (first and third round) and protein A- (second and fourth round) Sepharose, previously coated with 30 μg of mAb HC-10-isotype-matched mAb W6/32. After a 1-h incubation at 4°C, unbound phage particles were recovered and incubated with 30 μl of packed protein A- (first and third round) and protein G- (second and fourth round) Sepharose previously coated with 30 μg of mAb HC-10. After an additional 1-h incubation at 4°C, beads were washed 10 times with 1 ml of TBS, containing 0.5% Tween 20, to remove unbound phage particles. Bound phage particles were eluted by addition of 500 μl of 0.2 M glycine buffer, pH 2.8. The eluate was rapidly neutralized with 75 μl of 1 M Tris-HCl, pH 9.1. Eluted phage particles from each round were amplified by infecting Escherichia coli ER2738 (in early growth phase) cultured in Luria-Bertani broth containing tetracycline (20 μg/ml; Sigma-Aldrich). E. coli cells were removed by centrifugation on the following day. Phage particles were purified twice by precipitation with a one-sixth volume of polyethylene glycol-NaCl (16.7%/3.3 M), resuspended in 200 μl of TBS buffer and used as input for the next round. Phage enrichment (defined as percentage of eluted phage/input phage) at the end of panning was determined by spot titering eluted phage particles on Luria-Bertani plates containing 20 μg/ml tetracycline 5-bromo-4-chloro-3-indolyl β-d-galactoside-isopropyl β-d-thiogalactoside. Twenty single colonies were selected and amplified. Phage supernatants were tested in ELISA with mAb and used as a source for DNA purification. Unless otherwise indicated, all incubation steps were performed at 25°C. PBS, PBS containing 0.05% Tween 20 (PBS-T20), and PBS containing 0.5% of BSA (PBS-BSA) were used as coating, washing, and blocking buffer, respectively. Ninety-six-well microtiter plates (Falcon; BD Biosciences, Lincoln Park, NJ) were coated with mAb by incubating each well with 50 μl of a mAb solution (10 μg/ml) for 12 h at 4°C. After two washings and blockade of free protein-binding sites, 100 μl of supernatant containing amplified particles from each phage clone were added to wells and incubated for 2 h. Following four washings, wells were incubated for 1 h with an appropriate dilution of HRP-conjugated, affinity-purified goat anti-M13 Abs. Plates were then washed and developed by the addition of 100 μl of freshly prepared o-phenylenediamine (OPD) solution. Color reaction was stopped with a 100 μl/well solution of 2 N H2SO4. Absorbance was read at 492 nm with a Multiscan microplate reader (Benchmark; Bio-Rad). Background binding was determined by incubating phage supernatant in wells coated with PBS-BSA and with mAb HC-10 isotype-matched mAb W6/32. Phage DNA was purified from supernatant of clones reactive in ELISA by using a Qiaprep spin M13 Kit (Qiagen, Valencia, CA) according to the manufacturer’s instructions, and sequenced on an automatic DNA sequencer (30007 ABI Prism) at the MWG-BIOTECH DNA sequencing facility (Eberesberg, Germany) with a −96gIII promoter primer. Nucleotide sequences corresponding to peptide inserts were analyzed with the ExPASy DNA translate tool (http://expasy.hcuge.ch/) and deduced amino acid sequences were obtained. The motif was identified by alignment of peptide sequences from mAb HC-10-positive clones with the “Multalin Protein” tool at Pole Bio-Informatique Lyonnaise (http://npsa-pbil.ibcp.fr/cgi-bin/npsa_automat.pl?page = /NPSA/npsa_multalin.htm). A homology search was conducted in a SWISS-PROT database. The “ProteinInfo” tool at Prowl (http://prowl.rockefeller.edu/) was used to retrieve protein sequences bearing the motif. The binding assay to test the reactivity of mAb or immune sera with synthetic peptides and purified HLA-B7 HC, and the inhibition assay to determine the ability of synthetic peptides to inhibit the binding of mAb to the peptide itself and to HLA-B7 HC were performed in 96-well microtiter plates (Falcon; BD Biosciences), as previously described (22). Inhibition by a peptide of the binding of FITC-conjugated mAb HC-10 to cells was performed by mixing 40 μl of PBS-BSA solution containing 10-fold serial dilutions of inhibitor (starting concentration 100 μg/ml) with an equal volume of an appropriate dilution of FITC-labeled probe. Following a 1 h-incubation at 4°C, the mixture was added to target cells (2 × 105) and incubation was prolonged for 1 h. Next, cells were washed once with 4 ml of PBS-BSA and their staining was analyzed with a cytofluorometer FACScan (BD Biosciences, San José, CA). Fluorescence data from 5000 viable cells were reported on a logarithmic scale. Controls included binding of FITC-labeled probe in the absence of inhibitor. Background binding was determined by staining cells with FITC-mAb HC-10 in the presence of a saturating amount of cold mAb. Three BALB/c mice were primed with an i.p. injection of 100 μg of purified peptide (or BSA) coupled to keyhole limpet hemocyanin in the presence of glutaraldehyde (23) and mixed with CFA (Invitrogen-Life Technologies, Carlsbad, CA). Mice were then boosted with 100 μg of the same immunogen in IFA on days 7 and 14. Serum was harvested on day 14 before the second booster and every week hereafter up to the eighth week. Sera drawn on day 35 displayed the highest binding titer with the corresponding immunogen and were used for the assays. Preparation of HLA-B7 HC-enriched supernatant, indirect immunoprecipitation with Abs, SDS-PAGE, and Western blotting were performed as described (22). Analysis of motif amino acids on a three-dimensional model of the HLA-I molecule was performed with the Swiss-PdbViewer at Glaxo Wellcome Experimental Research (http://www.expasy.ch/spdbv/mainpage.html). To identify the determinant recognized by mAb HC-10 on β2m-free HLA-I HC, phage-displayed peptide clones were isolated by panning the random phage display peptide library with mAb HC-10. At each round, phage particles binding to isotypic and allotypic determinants of mAb HC-10 were removed by a preadsorption step on mAb HC-10 isotype-matched mAb W6/32. Similarly, protein A and protein G were alternatively used during panning to minimize the isolation of phage-displayed peptides reactive with these proteins. Immunoscreening of 20 randomly selected colonies at the end of panning showed that they all reacted with mAb HC-10. The binding is specific because no reactivity with mAb W6/32 was detected. Eight mAb HC-10-reactive clones were selected for sequencing (Table I⇓). Nucleotide sequence analysis of these clones identified seven distinct sequences in the peptides expressed by eight randomly selected independent clones. Alignment of the identified peptides is shown in Table I⇑. P, W, and D are present in six of the eight phage-derived peptides and R is present in all. A SWISSPROT-database search (http://prowl.rockefeller.edu/) showed that the motif PxxWDR (highlighted amino acids) could be aligned with amino acids P57, W60, D61, and R62 of the first domain of several HLA-I HC (Table II⇓), suggesting that this stretch is involved in their binding to mAb HC-10. Table II⇓ also presents the results of an alignment of the sequence of the HLA-B7 HC-derived peptide (spanning amino acids E55-T64) containing the motif, with the sequences of the same region from classical/nonclassical HLA-I alleles retrieved at the European Bioinformatics Institute database (http://www.ebi.ac.uk/imgt/hla/align.html). The motif amino acid substitutions identified were useful to define eight allele product groups. For each group a peptide was designed (p-1a/b to p-7). The shortest motif-containing peptide giving a reliable reactivity with mAb HC-10 was p-1a/b (spanning from E55 to T64). Shorter peptides failed to bind mAb HC-10, whereas longer peptides, such as the p-1a/1b-derived Q54-T64 (Qp-1a/1b) synthesized with an additional (conserved) Q at position 54, displayed a higher reactivity with mAb HC-10 than p-1a/b. Representative results are shown in Fig. 1⇓. Identification of the shortest motif (PXXWDR)-containing HLA-B7 HC-derived peptide binding to mAb HC-10. Fifty microliters of a PBS solution containing 5 μg/ml of peptides (indicated in each panel) were added to wells of a 96-well microtiter plate. Following a 12-h incubation at 4°C, three washings and blockade of the free protein-binding sites, 50 μl of 4-fold serial dilutions of mAb HC-10 (▪) were added to each well. After a 4-h incubation at 25°C and three washings, peptide-bound mAb was determined by sequential addition of an appropriate dilution of HRP-conjugated xenoantibodies to mouse IgG (Fc portion) and a freshly prepared OPD substrate solution. Color reaction was stopped with 100 μl of 2 N H2SO4. Absorbance was read at 492 nm in a Multiscan plate reader (Benchmark; Bio-Rad). Background binding was determined by replacing the experimental sample with PBS-BSA. Specific binding was determined by subtracting background binding from absorbance in the experimental well. mAb L31 (▴) and TP25.99 (•), which recognize determinants of HC distinct from that defined by mAb HC-10, were used as specificity controls. Peptides p-2 to p-7 were synthesized with the same length as p-1a/1b and tested in a binding assay with mAb HC-10 to determine whether the resulting reactivity profile paralleled that previously obtained by mAb HC-10 with cell surface HLA-I allospecificities. Fig. 2⇓ shows that mAb HC-10 bound p-1b (and p-1a) in a dose-dependent manner. The binding is specific, because no reactivity was detected with equal amounts of mAb L31 and mAb TP25.99 which recognize determinants of β2m-free HLA-I HC distinct from that defined by mAb HC-10 (4, 12). In contrast, mAb HC-10 did not react with peptides p-2, -3, -4, -5,-6, -7, and control p-Vβ17 bound to microtiter plates. Additional controls of the assay included the binding of mAb TP25.99 and L31 to HLA-B7 HC (sB7) and of mAb 655 to the corresponding p-Vβ17. 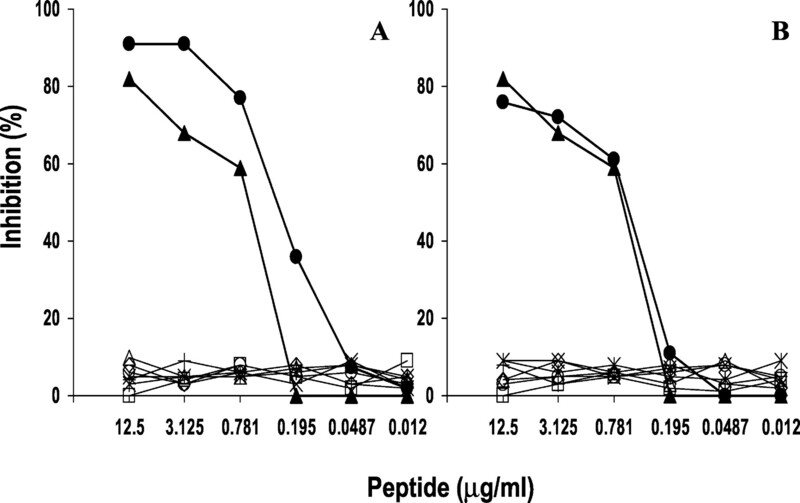 Effect of motif amino acid changes in peptides on their reactivity with mAb HC-10. Four-fold serial dilutions of a mAb HC-10 solution (▪) were added to wells coated with peptides, HLA-B7 HC (sB7), and the negative control p-Vβ17 (as indicated in each panel). After a 4-h incubation at 25°C and three washings, peptide-bound mAb was determined by sequential addition of HRP-conjugated xenoantibodies to mouse IgG (Fc portion) and OPD solution. Color reaction was stopped with 100 μl of 2 N H2SO4. Absorbance was read at 492 nm in a Multiscan plate reader (Benchmark; Bio-Rad). Binding of mAb L31 (▴) and TP25.99 (•) to a determinant of HC distinct from that seen by mAb HC-10, and of anti-p-Vβ17 mAb 655 (×), was included as the control. Motif amino acids are indicated in bold; amino acids different from those expressed in p-1b are underlined. To rule out the possibility that mAb HC-10 did not react with p-2 to -7 because of their failure to bind to the plates, or due to changes in their conformation associated with their binding to plates, p-2 to -7 were tested for their ability to inhibit the binding of mAb HC-10 to wells coated with p-1a (Fig. 3⇓A) and p-1b (Fig. 3⇓B). Only p-1a and -1b displayed inhibitory activity. In both cases, the inhibition was dose-dependent and specific, because p-Vβ17 displayed no detectable inhibitory effect. In all subsequent experiments, p-1a/-1b and Qp-1a/-1b gave superposable results in terms of antigenicity and immunogenicity. Hence, only data related to p-1a and Qp-1a will be shown hereafter. 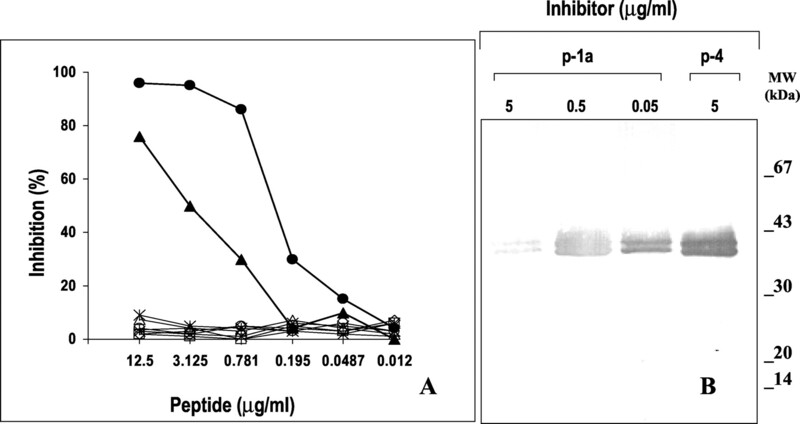 Effect of motif amino acid changes in peptides on their ability to inhibit mAb HC-10 binding to p-1a and p-1b. Fifty microliters of a PBS solution containing 4-fold serial dilutions of p-1a (•), p-1b (▴) p-2 (×), p-3 (⋄), p-4 (○), p-5 (▵), p-6 (+), and p-7 (∗) were mixed with an equal volume of an appropriate concentration of mAb HC-10 (3.12 μg/ml). After a 30-min incubation at 25°C, the mixture was added to wells coated with p-1a (A) and p-1b (B), and incubation was continued for an additional 4 h at 25°C. Wells were then washed, incubated with an appropriate dilution of HRP-conjugated xenoantibodies to mouse IgG (Fc portion), and developed by OPD solution. Color reaction was stopped with 100 μl of 2 N H2SO4. Absorbance was read at 492 nm in a Multiscan plate reader (Benchmark; Bio-Rad). Binding of mAb HC-10 in the presence of p-Vβ17 (□) was included as a negative control. Results are expressed as percentage inhibition of binding compared with binding in the absence of inhibitor. To determine the extent of HC mimicry by p-1a and Qp-1a, their ability to inhibit mAb HC-10 binding to the corresponding soluble or cell surface Ag was evaluated in two sets of experiments. Fig. 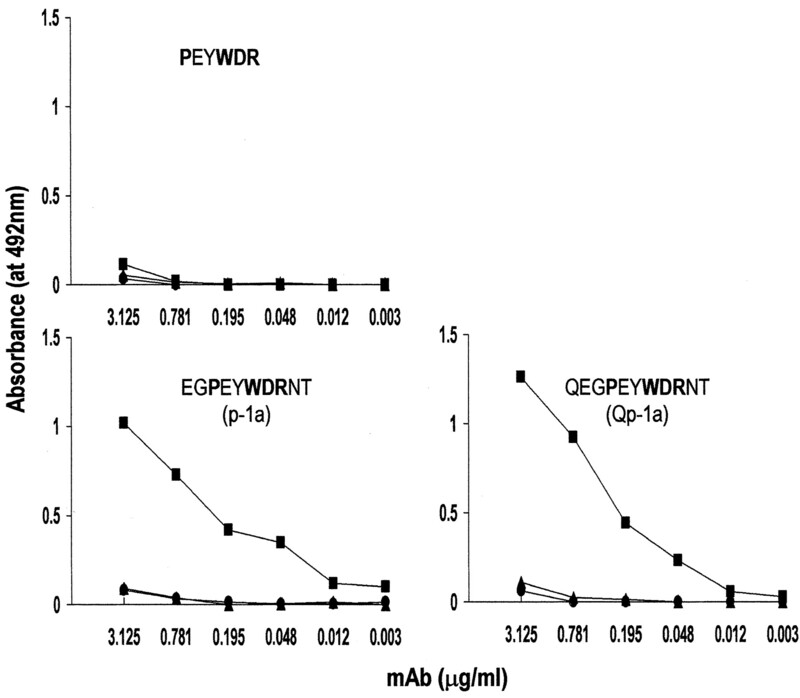 4⇓ shows that p-1a inhibited the binding of mAb HC-10 to native (Fig. 4⇓A) and denatured (Fig. 4⇓B) β2m-free HLA-B7 HC in a dose-dependent fashion. In both cases the inhibition is specific, because equal amounts of p-2 to p-7 and p-Vβ17 did not affect the binding of mAb HC-10 to HLA-B7 HC. In agreement with the results of the binding assay (Fig. 1⇑), Qp-1a displayed a greater inhibitory activity than p-1a (Fig. 4⇓A), suggesting that it resembles the mAb HC-10-specific binding site on β2m-free HC better than p-1a. 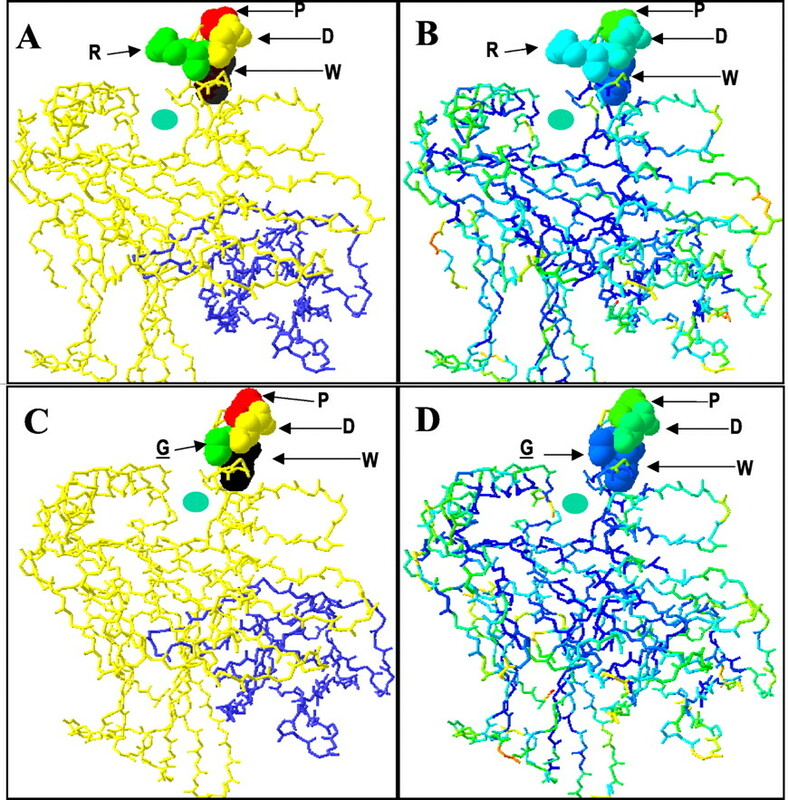 Effect of motif amino acid changes in peptides on their ability to dose-dependently inhibit mAb HC-10 binding to insolubilized native (A) and denatured (B) HLA-B7 H chain. A, Fifty microliters of a PBS solution containing 4-fold serial dilutions of Qp-1a (•), p-1a (▴), p-2 (×), p-3 (⋄), p-4 (○), p-5 (▵), p-6 (+), and p-7 (∗), were mixed with an equal volume of an appropriate concentration of mAb HC-10 (3.12 μg/ml). After a 30-min incubation at 25°C, the mixture was added to wells coated with HLA-B7 HC and incubation was continued for an additional 4 h. Then, wells were washed, incubated with HRP-conjugated xenoantibodies to mouse IgG (Fc portion), and developed by OPD solution. Color reaction was stopped with 100 μl of 2 N H2SO4. Absorbance was read at 492 nm in a Multiscan plate reader (Benchmark; Bio-Rad). Binding of mAb HC-10 in the presence of p-Vβ17 (□) was included as a negative control. Results are expressed as percentage inhibition of binding compared with binding in the absence of inhibitor. B, Purified HLA-B7 HC (800 ng/lane) were run on a 12% SDS mini-gel, electrophoresed under reducing conditions, and transferred to a nitrocellulose filter (Bio-Rad) by applying a current of 250 mA for 20 min in a semidry blotting apparatus (Bio-Rad). After blocking of free protein-binding sites with PBS containing 0.5% Tween 20, the filter was incubated with an appropriate dilution of biotinylated mAb HC-10 previously mixed with p-1a at the indicated concentration. After a 2-h incubation at 25°C, Ag-Ab binding was detected by sequential addition of HRP-conjugated avidin and diaminobenzidine-based substrate solution. Binding of mAb HC-10 in the presence of p-4 was included as negative control. This conclusion was corroborated in experiments that compared the ability of both peptides to inhibit the binding of mAb HC-10 to its corresponding epitope on membrane HC. As shown in Fig. 5⇓, only the peptide Qp-1a inhibited the staining of CEM cells by FITC-conjugated mAb HC-10 in a dose-dependent manner. Differential inhibition by Qp-1a (A) and p-1a (B) of mAb HC-10 fluorescence staining of human T lymphoid CEM cells. 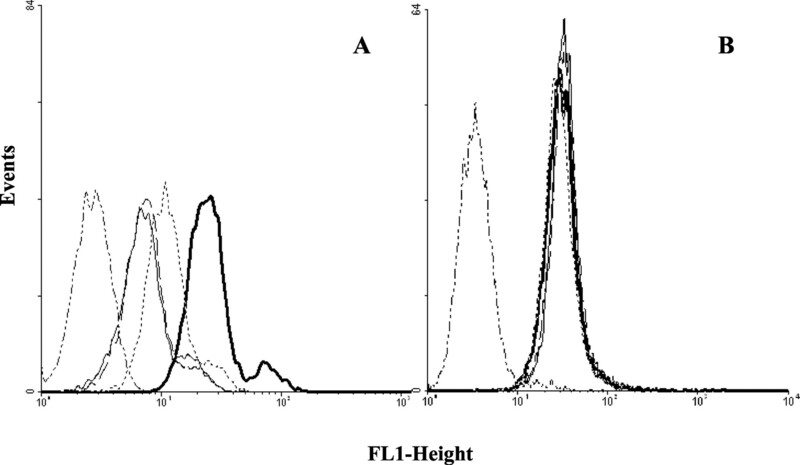 Fifty microliters of an appropriate dilution of FITC-conjugated mAb HC-10 were mixed with an equal volume of PBS-BSA containing 1 (dotted line), 10 (dashed line), and 100 μg/ml (thin continuous line) of either Qp-1a (A) or p-1a (B). Following a 1 h-incubation at 4°C, the mixture was added to target cells (2 × 105) and the incubation was prolonged for 1 h. Then, cells were washed and analyzed with a cytofluorometer. mAb HC-10 staining of cells in the presence of plain PBS-BSA (thick continuous line) was used as negative control. The unstained cell profile is indicated (dashed-dotted line). Additional experiments tested the ability of Qp-1a and Qp-1b to induce anti-HLA-I Abs. To this end, two groups of BALB/c mice (three mice/group) were immunized with the peptides. All the mice developed Abs reacting with the immunizing peptide. In addition, sera drawn on day 35, which have the highest titer with the immunizing peptide, reacted with purified HLA-B7 HC in Western blotting (representative results are shown in Fig. 6⇓, left panel). The reactivity is specific, because the immune sera did not react with BSA. The specificity of the assay was further indicated by the binding of mAb HC-10 and anti-BSA immune sera to HLA-B7 HC and to BSA, respectively, and by the lack of reactivity of the preimmune sera with both Ags. Blocking experiments showed that the Abs elicited by Qp-1a and Qp-1b specifically inhibited the binding of biotinylated mAb HC-10 to purified denatured HLA B7 HC in a dose-dependent fashion (representative results are shown in Fig. 6⇓, right panel). Comparison of the fine specificity of sera elicited with Qp-1a and mAb HC-10. Left panel, Purified HLA-B7 HC (sB7) (lane 1) and BSA (control) (lane 2) (800 ng/lane) were run on a 12% SDS mini-gel, electrophoresed under reducing conditions, and transferred to a nitrocellulose filter that was then incubated for 3 h with mAb HC-10 (3 μg/ml) (A) and a 1/50 dilution of anti-Qp-1a (B) immune serum. Ag-Ab binding was detected by sequential addition of HRP-conjugated xenoantibodies to mouse IgG (Fc portion) and diaminobenzidine-based substrate solution. The binding of anti-BSA serum to HLA-B7 HC and to BSA was included as specificity control (C). Background binding was determined by replacing immune sera with preimmune sera (D). Right panel, Binding of biotinylated mAb HC-10 to HLA-I HC in the presence of anti-Qp-1a serum diluted 10 (lane 1), 50 (lane 2), and 250 (lane 3) times. Binding of mAb HC-10 in the absence of inhibitor (lane 4) and in the presence of a 1/10 dilution of anti-BSA serum (lane 5) was included as control. It is noteworthy that peptides p-1a and p-1b are not immunogenic because they induced neither anti-peptide nor anti-HLA-I Abs in mice. Two established three-dimensional models of HLA-I molecules were retrieved from the Protein Data Bank at the National Center for Biotechnology Information (http://www.ncbi.nlm.nih.gov/): one corresponds to the mAb HC-10-reactive HLA-Aw68 Ag (PDB accession number: 1HSB), bearing the motif PxxWDR (Fig. 7⇓, A and B), the other is the mAb HC-10 nonreactive HLA-A0201 Ag (PDB accession number: 1DUZ) with the motif amino acid R62 replaced by G62 (Fig. 7⇓, C and D). It can be seen that motif amino acids are closely related to the HLA-specific peptide binding pocket as they constitute a portion of its lateral wall. The position of the arbitrarily colored motif amino acids (Fig. 7⇓, A and C) indicates that the amino acid at position 62 comes into closer contact with the pocket. Furthermore, the access of R62 (with its side chain) to mAb HC-10 can be more readily hindered by the presence of the HLA-specific peptide in the pocket. Schematic representation of the position of motif amino acids and their surface accessibility on a three-dimensional model of mAb HC-10-reactive HLA-Aw68 (Protein Data Bank accession number 1HSB) (A and B) and mAb HC-10-nonreactive HLA-A0201 (Protein Data Bank accession number: 1DUZ) (C and D). Motif amino acids were arbitrarily colored (P57, red; W60, black; D61, yellow; R62 or G62, green) (A and C) or colored according to their surface accessibility (from 100% surface exposed to 100% hidden: green, light green, light blue, and blue) (B and D). H and β2m chains of HLA-I Ag are colored yellow and blue, respectively (A and C). Position of the HLA-specific peptide pocket is indicated (green dot). Coloring of motif amino acids according to their surface accessibility (Fig. 7⇑, B and D) showed that in both HLA-Aw68 and HLA-A0201 molecules P57 is exposed (deep green) and W60 is completely hidden (deep blue), while D61 is more surface-accessible on HLA-A*0201. These results indicate different conformational changes between the two molecules at the level of the mAb HC-10-defined motif. In this study, we have shown that the motif 57PxxWDR62 is involved in expression of the determinant recognized by mAb HC-10, because the peptides containing this motif specifically bind mAb HC-10, inhibit its binding to cellular β2m-free HLA-I HC, and induce HC-specific Abs. Furthermore, the differential expression of this motif on HLA-I HC accounts for the differential reactivity of mAb HC-10 with classical and nonclassical HLA-I alleles, which had been previously defined by one-dimensional gel-isoelectric focusing (7, 11, 12) and immunofluorescence analysis (10). Alignment of phage-derived peptides showed that R62 is expressed by all HLA-I Ags reactive with mAb HC-10, indicating that this residue is crucial for the expression of the corresponding determinant. This conclusion is supported by the results obtained by Sernee et al. (24), who found by truncation experiments that amino acids surrounding residue 60 were essential for mAb HC-10 binding. R62 was also found to be critical for the recognition of β2m-free HLA-I HC by mAb LA45 (8). At variance with the results obtained with mAb LA45 (8), N63 is not essential for the binding of mAb HC-10 to HLA-I HC as indicated by its reactivity with HLA-B*1302, B*1501, B*2705, and B*5201 alleles expressed on LBF (12), OLGA (12), JESTHOM (11), and KHAGHI (11) cell lines, respectively (Table III⇓). Replacement of R62 with the small polar E62 and Q62, as in p-2 and p-3, respectively, or with the nonpolar G62 and L62, as in p-4 and p-5, respectively, may account for the lack of mAb HC-10 reactivity with these peptides. This mechanism may also explain the lack of reactivity of mAb HC-10 with p-2-bearing HLA-A*2301 and -A*2402 alleles expressed on WT51 and DKB cell lines, respectively, (12); p-3-bearing HLA-A*0301, A*1101, A*3201 alleles expressed on PP, KHAGNI, and BCK cell lines, respectively, (11); p-4-bearing A*0201 and B*5702 alleles expressed on BSM (12) and 32/32 (11) cell lines, respectively; and p-5-bearing A*2902 expressed on 32/32 cell line (11) (Table III⇑). From this analysis, P57 also appears to be essential for expression of the determinant recognized by mAb HC-10, as its substitution with S causes loss of mAb HC-10 reactivity with p-6. The latter is identical in all the other residues to the mAb HC-10-reactive p-1b. This mechanism may explain the lack of reactivity of mAb HC-10 with nonclassical HLA-E Ags (10). Similarly, replacement of R62 with E may explain its failure to react with the p-7-bearing HLA-G alleles (24). Neither p-1a nor p-1b inhibited mAb HC-10 binding to β2m-free HC+ CEM. These results may reflect the higher association constant of mAb HC-10 for membrane-bound HC than for the synthetic peptides because the latter are in solution and/or because they mimic the determinant recognized by mAb HC-10 to a limited extent. Following addition of Q54, peptides p-1a and p-1b acquired the ability to inhibit the binding of mAb HC-10 to β2m-free HC+ CEM cells and induced IgG Abs with a specificity similar (or identical) to that of mAb HC-10 in BALB/c mice. The immunogenicity of Qp-1b (54QEGPEYWDRET64) in BALB/c mice deserves some comments in view of its high degree of homology with 54QEGPEYWERET64 of H2-Dd Ags, which is one of the two MHC alleles expressed in BALB/c mice. The only difference between the latter sequence and the synthetic peptide at the level of motif amino acids (bold text) is replacement of the small polar D61 with the chemically similar E61. This difference is not likely to account for the immunogenicity of Qp-1 nor is it likely that this immunogenicity is caused by the adjuvant used for the immunization, because the 55EGPEYWDRET64p-1b mixed with this adjuvant did not elicit Abs at detectable levels in BALB/c mice. We favor the possibility that the immunogenicity of Qp-1b reflects the poor tolerogenic properties of this portion of β2m-free HLA-I HC, which is barely exposed on resting T cells (5). In view of the marked increase in the expression of β2m-free HLA-I HC expressing the mAb HC-10-defined epitope following T cell activation (5), it is tempting to speculate that following immune system activation, this epitope may trigger B and/or T cell-mediated autoimmune responses. If this interpretation is correct, the mAb HC-10-defined epitope may play a role in the induction of the auto-anti-β2m-free HLA-I HC Abs found in the course of HIV infection (26) and provides a mechanism for the arthritogenic properties of the cytokeratin cross-reactive HLA-B27-derived peptide (spanning amino acids 60–72) (27), which partially overlaps the mAb HC-10-specific epitope. The close relationship between the arthritogenic and the mAb HC-10-specific epitopes of HLA-I HC may account for the ability of mAb HC-10 to prevent spontaneous inflammatory disease in HLA-B27 transgenic(B27+β2m°) mice (13). These findings in conjunction with those about the immunogenicity of Qp-1 suggest that the latter may be a useful immunogen to induce mAb HC-10-like IgG Abs with the expectation that they will control inflammatory disease by inducing mAb HC-10-like IgG. Mapping of the motif amino acids involved in the mAb HC-10-defined epitope in a three-dimensional model of HLA-I molecules has shown that R62 is spatially close to the peptide-binding pocket. This finding suggests that binding of mAb HC-10 to β2m-associated HLA-I HC may be inhibited by loading of the pocket with HLA-I Ag-binding peptides (6). Alternatively, the loading of the pocket with a high affinity peptide may induce conformational changes on residues critical for mAb HC-10 binding with the epitope loss, as envisaged in the mouse system with the anti-Kb mAb KU1 (28) and the anti-Ld mAb 64-3-7 (29). The latter two mAb and mAb HC-10 share a common ability to detect peptide free HC and recognize a similar region of the class I structure. mAb KU1 and 64−3−7 have their critical residues on a loop connecting a β strand (under the bound peptide) with the α1 helix (rising above the ligand binding site) (29), while mAb HC-10-defined peptide 55–64 maps to a region of an α1 domain, where the loop extends into helical conformation above the N terminus of the bound peptide (Fig. 8⇓). Three-dimensional model of mAb HC-10-reactive HLA-Aw68 (Protein Data Bank accession number: 1HSB) to compare the position and structure of HC-10-specific peptide E55-T64 (including the motif residues P57, W60, D61, and R62) with the position and structure of the amino acid stretch including the residues 48 and 50, which on the murine counterpart of HLA-I molecule are critical for the binding of the anti-peptide-free HC mAb 64-3-7 (29 ). Association of β2m with HLA-I HC does not interfere directly with mAb HC-10 binding because the corresponding determinant and the points of contact of β2m with the HC are spatially distant. This can partly explain the reported reactivity of mAb HC-10 with HC loosely but still associated to β2m (30). Another possibility is that mAb HC-10 binds an alternative conformation of the HC, not just a peptide-free, β2m-free form. This might explain why W60, which is hidden on mAb HC-10-reactive and nonreactive HLA-I (Fig. 7⇑), seems to be crucial for the HC-10-defined epitope expression. It is reasonable to speculate that the peptide 55–64 including the mAb HC-10-defined motif, is in a more extended conformation on the β2m-free HC (31). Transfer of the mAb HC-10 epitope using mutagenesis to convert a nonreactive allele to a reactive one will be useful to address these points and to support HC-10-epitope definition in relation to conformational changes occurring when peptide and/or β2m bind or dissociate (29). We thank Drs. H. L. Ploegh (Harvard Medical School, Boston, MA) and L. Lopalco (San Raffaele Institute, Milan, Italy) for providing mAb HC-10 and mAb L31, respectively. We are grateful to Vito Iacovizzi for his excellent secretarial assistance. ↵1 This work was supported by Grant No. 01.00271.PF49, 2001, from Consiglio Nazionale delle Ricerche, by Associazione Italiana per la Ricerca sul Cancro (Italy), and by U.S. Public Health Service Grants CA67108 and P30 CA16056 awarded by the National Cancer Institute, Department of Health and Human Services. ↵3 Abbreviations used in this paper: HC, H chain; β2m, β2-microglobulin; HLA-I, HLA class I; OPD, o-phenylenediamine. Krangel, M. S., H. T. Orr, J. L. Strominger. 1979. Assembly and maturation of HLA-A and HLA-B antigens in vivo. Cell 18:979. Otten, G. R., E. Bikoff, R. K. Ribaudo, S. Kozlowski, D. H. Margulies, R. N. Germain. 1992. Peptide and β2-microglobulin regulation of cell surface MHC class I conformation and expression. J. Immunol. 148:3723. Danliczyk, U. G., T. L. Delovitch. 1994. β2-Microglobulin induces a conformational change in an MHC class I H chain that occurs intracellularly and is maintained at the cell surface. J. Immunol. 153:3533. Desai, S. A., X. Wang, E. J. Noronha, Q. Zhou, V. Rebmann, H. Grosse-Wilde, F. J. Moy, R. Powers, S. Ferrone. 2000. Structural relatedness of distinct determinants recognized by monoclonal antibody TP25.99 on β2-microglobulin-associated and β2-microglobulin-free HLA class I heavy chains. J. Immunol. 165:3275. Schnabl, E., H. Stockinger, O. Majdic, H. Gaugitsch, I. J. Lindley, D. Maurer, A. Hajek-Rosenmayr, W. Knapp. 1990. Activated human T lymphocytes express MHC class I heavy chains not associated with β2-microglobulin. J. Exp. Med. 171:1431. Carreno, B. M., T. H. Hansen. 1994. Exogenous peptide ligand influences the expression and half-life of free HLA class I heavy chains ubiquitously detected at the cell surface. Eur. J. Immunol. 24:1285. Madrigal, J. A., M. P. Belich, R. J. Benjamin, A. M. Little, W. H. Hildebrand, D. L. Mann, P. Parham. 1991. Molecular definition of a polymorphic antigen (LA45) of free HLA-A and -B heavy chains found on the surfaces of activated B and T cells. J. Exp. Med. 174:1085. Grassi, F., R. Meneveri, M. Gullberg, L. Lopalco, G. B. Rossi, P. Lanza, C. De Santis, G. Brattsand, S. Butto, E. Ginelli, et al 1991. Human immunodeficiency virus type 1 gp120 mimics a hidden monomorphic epitope borne by class I major histocompatibility complex heavy chains. J. Exp. Med. 174:53. Seitz, C., B. Uchanska-Ziegler, A. Zank, A. Ziegler. 1998. The monoclonal antibody HCA2 recognises a broadly shared epitope on selected classical as well as several non-classical HLA class I molecules. Mol. Immunol. 35:819. Little, A. M., E. Nossner, P. Parham. 1995. Dissociation of β2-microglobulin from HLA class I heavy chains correlates with acquisition of epitopes in the cytoplasmic tail. J. Immunol. 154:5205. Setini, A., A. Beretta, C. De Santis, R. Meneveri, A. Martayan, M. C. Mazzilli, E. Appella, A. G. Siccardi, P. G. Natali, P. Giacomini. 1996. 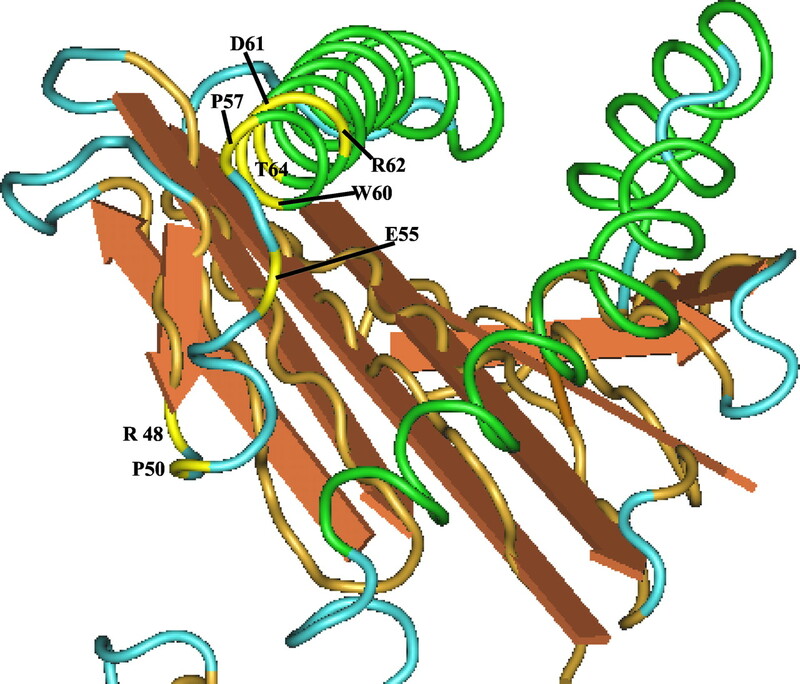 Distinctive features of the α1-domain α helix of HLA-C heavy chains free of β2-microglobulin. Hum. Immunol. 46:69. Khare, S. D., M. J. Bull, J. Hanson, H. S. Luthra, C. S. David. 1998. Spontaneous inflammatory disease in HLA-B27 transgenic mice is independent of MHC class II molecules: a direct role for B27 heavy chains and not B27-derived peptides. J. Immunol. 160:101. Hiraki, D. D., K. See-Tho, E. Filvaroff, S. Krishnaswamy, W. de Bello, B. Taidi-Laskowski, F. C. Grumet. 1994. Bioengineered soluble HLA-B7: genesis, characterization, and occurrence of dimerization. Hum. Immunol. 40:235. Barnstable, C. J., W. F. Bodmer, G. Brown, G. Galfre, C. Milstein, A. F. Williams, A. Ziegler. 1978. Production of monoclonal antibodies to group A erythrocytes, HLA and other human cell surface antigens-new tools for genetic analysis. Cell 14:9. Hajek-Rosenmayr, A., L. Jungl, M. Stammler, M. Kirnbauer. 1989. HLA-C “blank” alleles express class I gene products: biochemical analysis of four different HLA-C “blank” polypeptides. Immunogenetics 30:399. Tanabe, M., M. Sekimata, S. Ferrone, M. Takiguchi. 1992. Structural and functional analysis of monomorphic determinants recognized by monoclonal antibodies reacting with the HLA class I α 3 domain. J. Immunol. 148:3202. Perosa, F., R. Carbone, S. Ferrone, F. Dammacco. 1990. Purification of human immunoglobulins by sequential precipitation with caprylic acid and ammonium sulphate. J. Immunol. Methods 128:9. Streicher, H. Z., F. Cuttitta, G. K. Buckenmeyer, H. Kawamura, J. Minna, J. A. Berzofsky. 1986. Mapping the idiotopes of a monoclonal anti-myoglobin antibody with syngeneic monoclonal anti-idiotypic antibodies: detection of a common idiotope. J. Immunol. 136:1007. Mecheri, S., M. Edidin, G. Dannecker, R. S. Mittler, M. K. Hoffmann. 1990. Immunogenic Ia-binding peptides immobilize the Ia molecule and facilitate its aggregation on the B cell membrane: control by the M1s-1 gene. J. Immunol. 144:1361. Perosa, F., M. Prete, G. Luccarelli, B. Favoino, S. Ferrone, F. Dammacco. 1999. Serum levels of β2-microglobulin-free heavy chain of HLA class I antigen in healthy individuals: relationship to their class I allotype. Hum. Immunol. 60:1058. Perosa, F., S. Ferrone, F. Dammacco. 1991. Anti-idiotypic monoclonal antibodies reacting with idiotope on isolated- denatured chains of an anti-CD4 monoclonal antibody. Immunology 74:748. Sernee, M. F., H. L. Ploegh, D. J. Schust. 1998. Why certain antibodies cross-react with HLA-A and HLA-G: epitope mapping of two common MHC class I reagents. Mol. Immunol. 35:177. Schreuder, G. M., C. K. Hurley, S. G. Marsh, M. Lau, M. Maiers, C. Kollman, H. J. Noreen. 2001. The HLA dictionary 2001: a summary of HLA-A, -B, -C, -DRB1/3/4/5, -DQB1 alleles and their association with serologically defined HLA-A, -B, -C, -DR, and -DQ antigens. Hum. Immunol. 62:826. Borghi, M. O., C. De Santis, W. Barcellini, L. Lopalco, C. Fain, A. Lazzarin, A. G. Siccardi, P. L. Meroni, C. Zanussi, A. Beretta. 1993. Autoantibodies against β2-microglobulin-free HLA antigens in AIDS patients. J. Acquired Immune Defic. Syndr. 6:1114. Wildner, G., M. Diedrichs-Mohring, S. R. Thurau. 2002. Induction of arthritis and uveitis in Lewis rats by antigenic mimicry of peptides from HLA-B27 and cytokeratin. Eur. J. Immunol. 32:299. Machold, R. P., H. L. Ploegh. 1996. Intermediates in the assembly and degradation of class I major histocompatibility complex (MHC) molecules probed with free heavy chain-specific monoclonal antibodies. J. Exp. Med. 184:2251. Yu, Y. Y., N. B. Myers, C. M. Hilbert, M. R. Harris, G. K. Balendiran, T. H. Hansen. 1999. Definition and transfer of a serological epitope specific for peptide- empty forms of MHC class I. Int. Immunol. 11:1897. Gillet, A. C., B. Perarnau, P. Mercier, F. A. Lemonnier. 1990. Serological analysis of the dissociation process of HLA-B and C class I molecules. Eur. J. Immunol. 20:759. Catipovic, B., G. Talluri, J. Oh, T. Wei, X. M. Su, T. E. Johansen, M. Edidin, J. P. Schneck. 1994. Analysis of the structure of empty and peptide-loaded major histocompatibility complex molecules at the cell surface. J. Exp. Med. 180:1753.